The sublime custom-designed and built Whitehaven 7500 Sports Yacht, Finito, was designed as its owners’ “forever boat”, brimming with custom-made features and high-tech equipment, including full, state-of-the-art Twin Disc transmission and propulsion control systems. In mid-November, the new flagship of the Whitehaven Motor Yachts range was officially handed over to its ecstatic owners, Ray and Denise David. The experienced, long-range cruising couple took delivery of their Whitehaven 7500 Sports Yacht on the Gold Coast and plan to cruise back to their home port of Darwin, taking in plenty of angling, languorous evenings on the foredeck watching the sun set and testing out all the high-tech gear they specified for their one of a kind true bluewater cruising yacht. Working closely with Whitehaven founder, Keith Hanson, Ray and Denise were impressed with all the attributes of the Twin Disc systems. Finito uses the revolutionary new Twin Disc QuickShift transmission, designed to interface with the Twin Disc EC300 MGX Electronic Control System. Added to that, there are three Express Joystick System® stations, one at the main helm, one each side in the cockpit. The Twin Disc Express Joystick System® (EJS®) revolutionises docking and slow speed manoeuvering of diesel powered, conventional driveline boats. With easy fingertip movements owners control direction and speed, instantaneously. 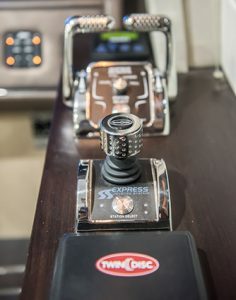 Working in tandem with the with Twin Disc Express Joystick System, Express Positioning® maintains a vessel in a fixed position and heading at the touch of a button. A dedicated, highly accurate and reliable GPS receiver determines the vessel’s exact location and heading and the Twin Disc EC300JS controller commands the Twin Disc QuickShift® transmissions and Twin Disc proportional hydraulic thrusters to smoothly and instantaneously maintain the precise station coordinates and heading. Trevor Tucker, Sales Manager, Northern region, Queensland, NZ, South Pacific and PNG explains how it all fits together seamlessly in one great package. “The Twin Disc integrated system starts with QuickShift transmission for precise control of the propellers. Over the top of those gear boxes is the EC300 dual leverhead station at the main helm. Then we added the Express Joystick system that puts you in complete control of the props and the proportional bow and stern thrusters, which ramp up and ramp down progressively depending on the movement of the Joystick. The hydraulic thrusters were supplied by Side Power as was the stabilization system. In a first for the company globally, Twin Disc Pacific integrated its system with the Side Power hydraulic thruster system. “And it worked very well, in fact it was perfect!” states Trevor. Hydraulic thrusters were specified as they allow for continuous operation where electric thrusters do not. “Electric are good for trimming the boat while docking, but with continuous use can overheat and shutoff,” adds Trevor. Finito can be controlled conventionally through the EC300 dual leverhead station right up to full speed, while the joystick is best for docking and travel or manoeuvring at slow-speed up to 10 knots. “With the Express Joystick you can drive the boat effortlessly around obstacles, through the eye of a needle,” says Trevor. “This is ideal in the case of Finito,” adds Keith. “The Joystick and positioning system are perfect for Ray and Denise. In Darwin, they have to take their boat through a series of locks and this system gives them precise control and manoeuvrability in a relatively confined space. The fly-by-wire concept behind the EC300 makes the system easy to install on a new boat or retrofit. This highly sophisticated electronic platform can be easily taught your preferred operating settings, making hunting for a specific “sweet spot” a thing of the past. Another compelling reason Whitehaven chose Twin Disc was its compatibility with other brands. For technical service and support Twin Disc is second to none, with a comprehensive dealer network across the Pacific region.